Welcome a new addition to the Herschel Hoard. 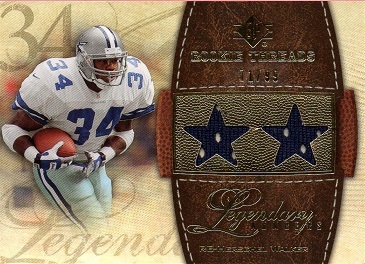 This is a 2008 SP Rookie Thread Legendary Numbers card of Herschel Walker. This particular version is serial numbered to 99, and has a jersey swatch in the form of two stars. 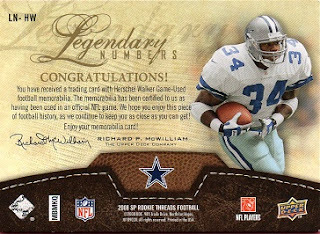 I also have the one that is numbered to 50. In that version, the swatch forms the players initials. This is card 573 as I work toward my goal of 600 different Walker cards.